Capt. Steve attending the Texas International Boat show, Corpus Christi, TX. photographed with Super Yacht Calixas 105. Capt. Steve a British national arrived on the sun drenched shores of South Texas one summer on a visit 20+ years ago while attending college and got the taste for the Tropical S. Texas lifestyle. After completing college travelled to France worked in a variety of crew positions on charter boats and yachts on the French Riviera, based in the Mediterranean port of Antibes. Steve attained much of his initial experience as a crew member and people person there. Several years later he took an opportunity to move to the USA to join a local Sailing School and Charter Boat Company teaching ASA Sailing programs and running captain charters. Also during that time worked as delivery crew doing offshore deliveries to/ from the Caribbean for a new start up company on the east coast which aided in gaining those much needed sea miles to attain his US Coast Guard Marine License. 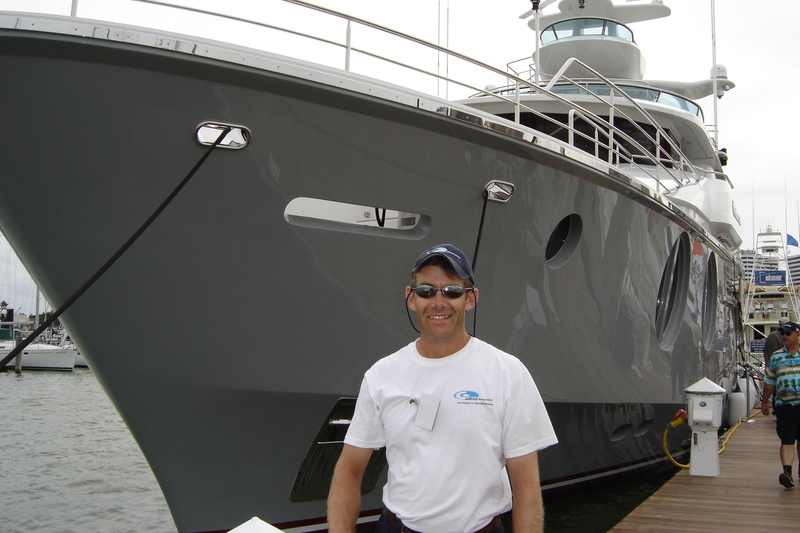 Currently owner and operations manager of an established yacht management/ maintenance business in the Corpus Christi, Texas area, Steve manages and maintains yachts and boats for private owners and assists with the overall upkeep, maintenance and refits of their vessels. Steve has a trained eye for detail and a broad hands on knowledge and experience of both power and sailing vessels and their associated systems/ equipment. In addition to sailing Steve enjoys other water sports to include kayaking, swimming and is also a keen photographer and enjoys hiking, cycling & traveling with family. Although sailing is my passion any day afloat on the water is down PAT for me "Pure Aqua Therapy" . I'm proud to be a member & part of the Boatshed team & look forward in assisting our customers find new homes for their quality pre-owned vessels here in S. Texas. Please feel free to contact me and I look forward to working with you.